Now we get back to the things that I originally had in mind for this site and that is fashion, food and travel..after a couple of months of break (see my previous posts to know exactly what I am talking about!) I have been slowly heading back into the world that I know and love. My partners parents had been offering to take us out for dinner for a few months and the timing was just right and they wanted to take us to The Witch’s Cauldron in Subiaco for dinner, so never one to turn down a free meal off we headed for what felt like a step into a time warp and not necessarily in a good way! It has been a number of years since I was last there and it seemed as if in that time, time had stopped, the décor was almost identical and I did feel like I was back in the 1970’s and not the 2000’s with the seating, tables, bar, wall decorations etc but I thought I would withhold my judgement until we experienced the rest of the evening. The night on the whole was great because of the company and the chance to catch up and share news, happenings and family gossip, which I always enjoy, what was missing from the night was good service ( and if you follow this page you know how much I really want good service when dining out) and ambient feeling in the restaurant that was conducive to good dining and a menu that was uninspiring to say the least. 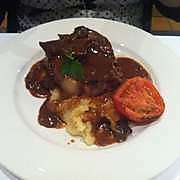 There were 2 main options for dinner – the a la carte menu or a three course options menu for $70per head. We opted for the second one as we all saw things that we wanted to try on this and it made sense in terms of cost for the night to do that. 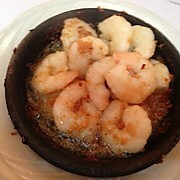 The one item that the Witch’s Cauldron is famous for is their garlic prawns and they have ridden on the coattails of this dish for many years. Both my partners parents opted for this dish to start with and Trevor and I went with the chicken liver pate for our entrees. One thing you cannot fault them on is portion size. You will never leave with Cauldron hungry as the size of the portions for entrée and main course were generous. The garlic prawns were bountiful and the feedback was that they were tasty and enjoyable but the serve was just a little too big. The pate was also a good size but I was amused to see an orange slice as a garnish (here I am back in the 70’s) and no real attempt to bring the serving of dishes into the modern century at all, but I suppose that meant that it really was just like the décor on offer. It was tasty and there was plenty of freshly grilled toast to go with it. For main course our table ordered sirloin, lamb fillets and the chicken with duxelle and all the dishes were again a good size and there were no complaints about them except that both the lamb and the chicken were really missing any really strong flavours to add to the dish and left a feeling of them being quite bland and pedestrian in terms of taste and presentation. The sirloin was cooked perfectly and tasted delightful and so no complaints there at all. For dessert three of us had the lemon and coconut tart and I had the yoghurt panna cote with mixed berry compote and all of these were great finishes to the meal. For $70 for three courses this was not a bad deal, but what really let this down for me was the ambience and décor were really more like an old pub setting than a highly regarded restaurant and the service was really not good at all. My partner really wanted a glass of red wine with his main course and we did not get any service to our table after the main course was served to be able to ask for this or even get the chance to attract our waiters attention to order it. After we had been served our wine at the start of the night and a beer had been ordered we were not invited to order any other drinks which I think is a real disappointment. Waiters need to be attentive enough without getting in the way and when a bottle of wine is finished should enquire to see if something else is wanted…also the mineral water was small bottles and not the usual 750ml ones that you get in most good restaurants these days and to be charged $7 per bottle is a bit rich really. So if you want to take a time warp back to the 70’s then head to the Witch’s Cauldron but be prepared for a pretty standard 1970’s inspired menu and décor that is uninspiring to say the least! Rehab works wonders and a potential 4 – 6 week stay is dramatically reduced!